WhWhere did these men come from? How did they evolve into this image that we have of them? In the 7th century, the political arena of Japan had begun to resemble the feudal system that had evolved in Europe. There was a need for the wealthy landowners to have protection and the samurai warrior or Bushi was born. These were usually relatives or financial dependents and in some cases, mercenaries, that gave each landowner his protection against his neighbors for himself and the small farmers that were his domain. By the 10th century, a strict code of honor had developed that put loyalty to one’s master even above family loyalty and it was called the Samurai code of honor or the Bushido. These men were the equivalent of the Medieval Knight in Japan. However, unlike the European Knights, the political rule in Japan had deteriorated and the Warrior Class stepped in to not only bring order to the rural regions but to rule them as well, giving them now both military and political power. That left the Emperor with only the capital of Japan, Kyoto, to govern. When the Emperor Toba died without an heir in 1150, two different Samurai factions battled for the leadership of the entire nation. The Minamoto and the Taira Samurai clans battled for nearly 25 years before the Minamoto succeeded and the position of emperor simply became a figurehead while the Minamoto Shoguns, or military generals, ruled the entire southern region of Japan until 1333. This led to series of various rules, some with token emperors but with some form of the Samurai firmly in leadership until the 19th century. The Bushido, or “The Way of the Warrior” became the guidelines for this new culture with honor and freedom from fear of death as its tenets. Their weaponry during the early part of their history was first derived from trade with their Northern neighbors, the Ainu. The Ainu were a strong nation that resisted Japanese control until the 19th century when they were conquered and are now absorbed into their culture. It was the Ainu who first produced what we now call Japanese swords probably based on their trade with China and the Chinese methods of sword smithing. Their shapes, styles and forging techniques differed greatly from their European counterparts and were perfected by the time of the rise of the Samurai warrior prince around the 10th century. 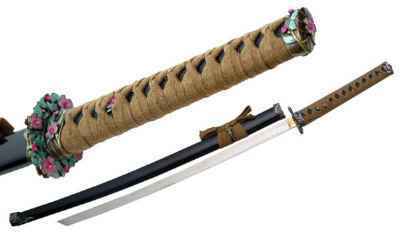 The sword, the principal weapon of the Samurai, changed through history as the style of fighting changed. The early swords and spears were for fighting from a horse, as the predominant military units were cavalry. These soldiers were archers who used very long bows, who utilized their swords during battle only when necessary, exactly like their European counterparts. These first very long swords known as Tachi were used mainly at the end of battle to disperse their dying enemies but were designed with the curve of the blade more toward the hilt which would give an advantage to a rider under attack from ground troops. 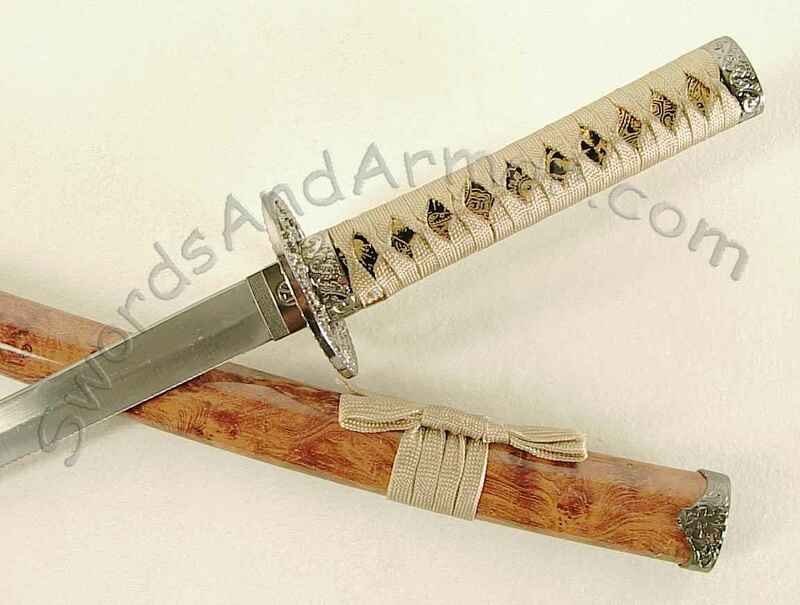 These were the longest of the Japanese swords and the workmanship was superb with many foldings of metal going into the making of the blade and mastery of balance, strength and purity of design that could take weeks or months to produce. There were five major schools of sword production at the height of this Samurai culture as it was considered a sacred art, each leaving its individuality on the swords of their design. Eventually, as less need for the longer sword in battle developed, the slightly shorter Katana replaced the Tachi as the main sword of the Samurai as well as the Naginato or the long spear, which appeared during this early time as well. Events that impacted this culture came in the form of Kublai Khan in 1268. After refusing to give the Khan tribute, he began attacking Japan and probably would have won if nature had not intervened to sink his armada, not once but twice when he attempted a full scale invasion into the country. For twenty years however, the skirmishes with his Mongol warriors changed the Samurai’s approach to warfare and the Japanese swords changed as well. The Samurai began to rely on his sword more than his bow and eventually the bow was set aside for a double set of swords, together called Daisho, or “long and short”. 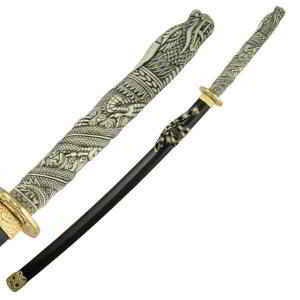 This was Katana, a curved longer sword for slashing and Wakizashi, a shorter sword used for stabbing. No one was allowed to wear this by the mid-sixteenth century except the Samurai. These sets were rarely matched, as the Wakizashi required a different type of smithing than the longer swords but all were made from the Japanese double steel method and only the Japanese Tamahagane steel is recognized for the legitimate Samurai sword. 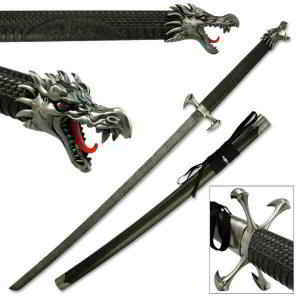 The Tanto sword, an even smaller design is the equivalent of a dagger and was sometimes substituted for the Wakizashi.